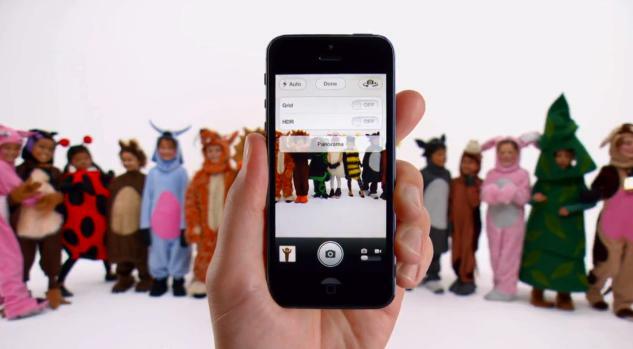 After a series of TV ads in July which were considered by many to be a bit on the lousy side, Apple has had another try – this time with its first ads for the iPhone 5. Called Thumb, Cheese, Physics and Ears, the slick 30-second skits, each with a voiceover from Newsroom star Jeff Daniels, focus on various aspects of the Cupertino company’s new handset. Meanwhile, a parody ad posted on YouTube poking fun at the refreshed smartphone has clocked up almost 1.5 million hits in just a couple of days….more on that in a moment. First, the new ads by Apple. Thumb shows how the new screen – taller but not wider – allows for single-thumb operation of the device. Perhaps fearful of consumers jumping straight for handsets with bigger screens, such as the Galaxy S3, Apple has decided to highlight one of the advantages of its widescreen design. Cheese demonstrates the new Panorama feature enabling ultra-wide shots; Physics shows off the dimensions of the new device, asking how something can get bigger while getting smaller; and Ears takes a look at the new EarPod headphones bundled with the smartphone.